A family doctor has spent three months working at the world's highest hospital, helping treat people among the peaks of the Himalayas. Usually based in Devon, Neil Rushton was working 4,270m above sea level at a centre run by the Himalayan Rescue Association in the village of Pheriche, Nepal. 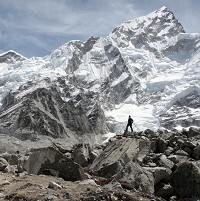 Patients treated were either local people or those trekking up Mount Everest who were able to use the medical centre. The centre is a welcome sight for climbers feeling the burn, however those with ongoing health issues should also arrange tailored pre-existing medical travel insurance before leaving home. However, the 60-year-old doctor insists he was "not just treating rich Western climbers" during his sabbatical which began in September. He said: "About 60% of the time we were treating Nepalese, pretty much for free; seeing them, treating their children, stitching them up, looking after fractures, looking at their general health." His partner Ceri Lloyd, who was also in Pheriche with him, said: "It was really exciting. To actually look where Edmund Hillary and all these people climbed was absolutely fantastic."